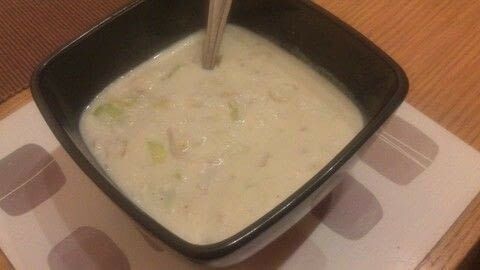 Nice and simple Potato And Leek Soup! My version of Potato Leek Soup. EnJoy!! Add the leek into the pan. Don't caramelize them, just tender them. While the leeks are being tenderized, chop the potatoes up and boil them for a while. Keep some water over, you'll need it later. As it's a bit thick, add the water you kept over from the boling potatoes and mix the leeks in.